Adolescent Girls and Boys call for an Enabling Environment that Promotes Menstruation with dignity and Zero stigma and Discrimination. Founder and Team Leader – Uganda Youth and Adolescents Health Forum / V. President AfriYAN East and Southern Africa Region. Uganda Youth and Adolescents Health Forum (UYAHF) in joint partnership with AfriYAN Uganda Chapter on the 24th of May 2016 held a Menstrual Hygiene Awareness Sessions at the Reach a Hand Uganda, Life in My Shoes Youth Camp held at Hana Mixed School hosted by Reach A Hand Uganda (RAHU). The Session’s overall goal was aimed at steering discussion and promoting dialogue and learning between adolescent girls and boys on the need to create a supportive environment – for young women and adolescent girls to be able to enjoy and manage their menstruation hygienically, safely, and with dignity and privacy. The session attended by about 300 young people including teachers and some members of the public raised awareness and empowered participants with information to demystify myths and break the stigma and taboos surrounding menstruation. Participants listening to Francesca UYAHF Volunteer staff as she made her presentation on Menstruation with Dignity. Participants including students and teachers were able to highlight the nature and consequences of poor menstrual hygiene management and they suggested innovative strategies and sustainable solutions to address menstrual hygiene challenges. Annet Nabachwa 16 years and a Senior 4 Student from Hanna mixed noted that, many girls in their school have no access to sanitary material and many resort to using cloths, which is note safe. It’s imperative to note that at the onset of puberty, boys and girls embark on a transitioning journey of growing into adults. During puberty boys and girls will experience many changes ranging from physical, psychological e.t.c and Menstruation is just one of these changes. For many girls, starting menstruation does not mean a girl has become a woman overnight. 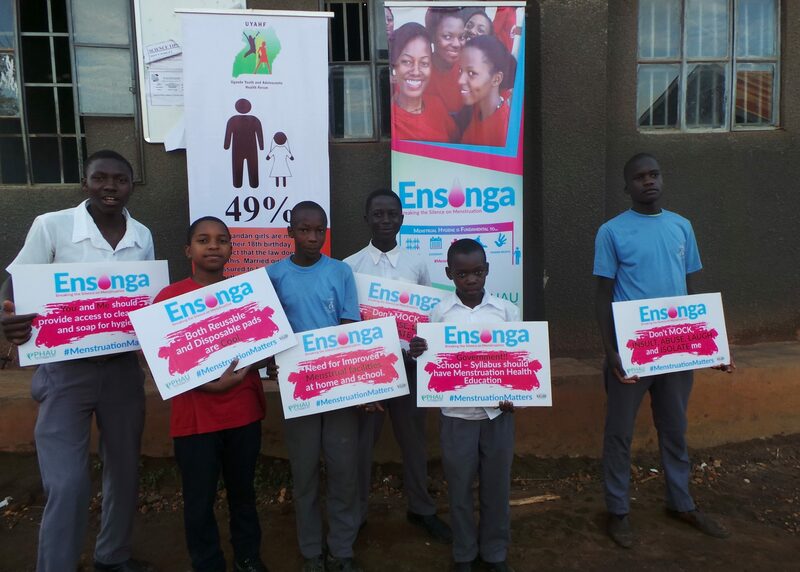 Young Men Pause at the Menstrual hygiene Banner to show their solidarity for menstruation with dignity. Menstruation is one major common and unique experience identified by many disadvantaged women and girls as a driver of gender inequality and disempowerment as it poses barriers in a woman’s ability to engage in education and decision making. All women and girls have a right to enjoy their periods with dignity, no shame and none discrimination, noted Paul Weboya the UYAHF program Officer as he facilitated at the session. Menstruation hygiene is a fundamental right for all women and girls and it has impacts on other multiple human rights of women and girls including; the right to sanitation, education health and employment with dignity. Menstruation with dignity and non discrimination is a driver and an enabling factor for change as it enables women and girls to achieve their potential and meaningfully engage in discussions that challenge traditional gender roles. By the end of the sessions young people including opinion leader present like teachers had increased knowledge on the role and the need of good menstrual hygiene management as an enabling factor for women and girls to reach their full potential. Both the students and teachers also committed to support and create an enabling environment for proper menstrual hygiene practices and enjoyment of menstruation with dignity. This entry was posted in Uncategorized on June 14, 2016 by patsewa.